Fairbanks, a low, sprawling frontier town along the Chena River, supports a huge land area. As a crossroads of major highways and the northern terminus of the Alaska Railroad, Fairbanks plays a significant role as a transportation center and commerce headquarters for most of the northern half of the state. Additionally, the area serves as a military, education and health center for the region; the University of Alaska-Fairbanks is a large employer. Mining, forest products, the Alaska Pipeline, and tourism drive the economy and recent job growth has been fairly healthy. Due to its isolation and the obvious effects of climate, the area not surprisingly has a strong sense of community, but there isn’t a lot of outside stimulus or entertainment. The downtown area is clean and mostly modern. As with all of Alaska, cost of living is high. The summer climate and nearby recreation are exceptional, but winters are equally extraordinary with depressing darkness and below-zero temperatures almost daily. Fairbanks is located in the Tanana Valley and experiences a distinctly Continental climate with extreme temperature variations most of the year. 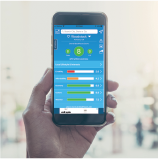 Because of its location just 200 miles south of the Arctic Circle, summer days are 18-21 hours long and solar heating can produce pleasant 80 degree readings. Unbelievably for the latitude, the record high was 99 degrees, recorded in July 1919. Winter daylight, however, ranges from 4 to 10 hours per day, with prevalent below-zero temperatures, reaching -40 degrees or lower each winter. Winter temperatures, in fact, can range from +45 degrees to -65 degrees, with summer temperatures ranging from +30 degrees to +90 degrees. Snow cover persists from October to April, although cold air and mountain protection limits days with heavy snows to a minimum, and blizzards are seldom seen. Cold air trapped in the valley produces occasional ice fog. Occasional summer showers and thunderstorms, especially in nearby mountains, round out the precipitation picture. The median home price in South Van Horn is $21,500. Browse Homes in this Range. 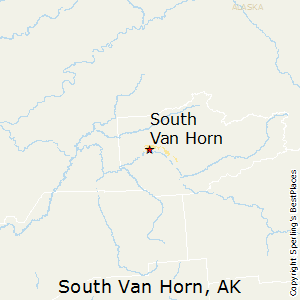 Compare South Van Horn, Alaska to any other place in the USA.